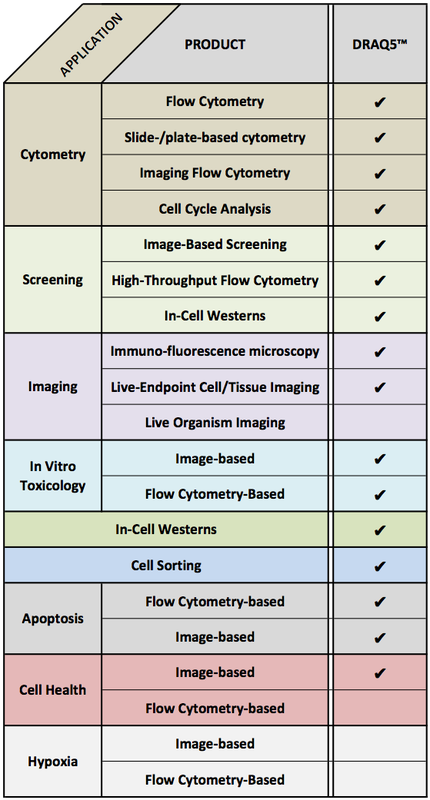 DRAQ5™ is the proven far-red fluorescent DNA dye for LIVE or fixed cell analysis. It is spectrally compatible with most visible-range fluors including GFP/FITC and R-PE. In microscopy and high content screening, DRAQ5™ allows easy nuclear counterstaining without UV excitation. In flow cytometry, DRAQ5™ allows phenotyping of blood/BM and direct cellular DNA content analysis without any RBC lysis or fixation, permeabilisation or RNase treatment. DRAQ5™ is available in two concentrations: 0.5mM and 5mM. The 0.5mM Convenience Pack allows for simple and convenient dilution. The 5mM Classic Packs come in three sizes; 50μl, 200μl and 1ml. Please get in touch if you would like to order bulk volumes of DRAQ5™. You can order DRAQ5™ directly from the website. DRAQ5™ is a small molecule (412DA) belonging to the anthraquinone family. It has peak absorbances at 600nm and 646nm. It fluoresces in the far-red / near infra-red (NIR) peaking at 697nm (bound to dsDNA). On a flow cytometer it is possible to detect DRAQ5™ using blue laser (488nm) excitation. DRAQ5™ readily permeates the lipid bilayer of cell membranes and intercalates with high affinity to dsDNA. There is no fluorescence enhancement on binding, thus the measured fluorescence is proportional and stoichiometric to the quantity of nuclear DNA present in the cell. There is no measurable binding to mtDNA (van Zandvoort, 2002) and DRAQ5™ shows negligible binding to RNA. DRAQ5 is highly photo-stable (Martin, 2005). skip the queue for the UV-equipped microscope with this far-red counterstain! DRAQ5™ is supplied as a deep blue aqueous solution in three concentrations: 0.5mM; 1.0mM and 5mM. Products are shipped at ambient temperature, but on receipt packs should be stored at 2-8°C. Do NOT freeze! DRAQ5™ can come out of solution when frozen and it is difficult (but not impossible) to get it back into solution. DRAQ5™ can be diluted in culture media (e.g. RPMI 1640) and physiological buffers (eg PBS, Hanks’s, etc.) and mixed with fixatives such as formaldehyde.